The American Gem Society Laboratories team began researching diamond cut in 2000, working closely with Dr. José Sasián at the University of Arizona in Tucson and other experts in diamonds, optics, and computer programming. The result is a new methodology that analyzes the light performance and proportions of a three-dimensional image of a faceted diamond. The previous proportion-based grading system for the standard round brilliant cut only addressed averages for the table diameter percentage, the eight crown main facet angles, and the eight pavilion main facet angles. Therefore, it was two-dimensional in nature. With the new performance-based cut grading system, the optical effects of all the facets are evaluated. This is the most technologically advanced, yet easy-to-use, cut grading analysis available today. The American Gem Society Performance Grading Software objectively measures and evaluates nine of the eleven grading factors. The remaining two — Polish and Symmetry — must be evaluated by a diamond grader. At the software’s core is a robust optical ray-tracing engine, which accurately measures Brightness, Dispersion, Leakage, and Contrast. In addition, the software calculates the volume of the object, determines its Durability, Tilt, and Weight Ratio. The Girdle Thickness is measured in sixteen areas known as the peaks and valleys, and the Culet Size is measured. The software evaluates the eleven factors, separating them into two different types of deductions — cumulative and net lowering — for each factor. The cumulative deductions are totaled from Brightness, Dispersion, Leakage, Contrast, Durability, Tilt, and Weight Ratio. 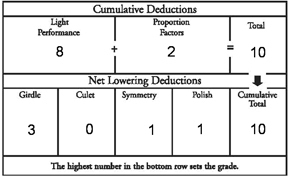 The net lowering deductions are individually considered for Girdle Thickness, Culet Size, Polish, and Symmetry. The software adds the cumulative numbers and then compares the sum to the individual net lowering deductions. The highest number sets the cut grade. Using 10x magnification, the diamond grader evaluates the Symmetry and Polish details of the diamond and assigns a grade from 0–10 for each. The grader observes the girdle in all areas for an extremely thin or very thin area. This is because the non-contact measuring device might inaccurately scan these areas. Finally, the grader observes the culet for damage. If it is chipped, the grader notes this under clarity. The performance-based American Gem Society cut grading methodology will facilitate the development of cut grading systems for any shape and facet arrangement. The industry will be able to optimize existing and patented cuts, as well as design and optimize new cuts. The square modified brilliant — also known as the princess cut, the square step cut, the rectangular step cut — known as the emerald cut, the octagonal step cut, and the oval round brilliant are currently included in the American Gem Society Diamond Grading Standards for cut. Additional education is available at various industry events and/or Guild meetings. American Gem Society experts deliver presentations on the cut grade, the American Gem Society Performance Grading Software, ASET, and the grader’s role in the grading process. The amount of white light returned to the observer. Brightness with positive contrast effects. The light and dark patterns seen when observing a diamond. It can produce a positive or negative optical effect. This usually is caused by, but not limited to, the observer’s head. The separation of white light into spectral colors. The diamond’s resistance to chipping or breaking. Areas that do not return light. The combination of white and colored sparkles seen as the diamond and/or the observer and/or the light source(s) move. The point at which the girdle reflects under the table of the diamond and is defined by the minimum pavilion angle allowed for each table size. The millimeter footprint of a diamond versus its weight.